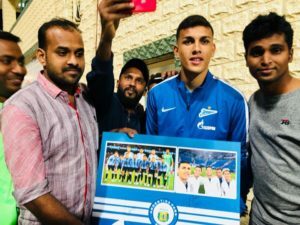 Home Latest News Argentina Fans From Kerala Meet Their Heroes! 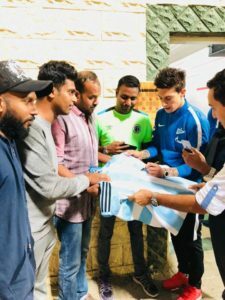 Argentina Fans From Kerala Meet Their Heroes! Here is a bit info about the southern state of Kerala in India. Nicknamed as the Spice Garden of India or the Land of the Coconuts, renowned for its palm-lined beaches and backwaters. 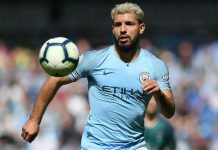 Like in most places in India, cricket is a popular sport in recent times but that doesn’t mean football is non-existence. As I’ve learned from Novy KAPADIA’s Barefoot to Boots : The Many Lives of Indian Football, it also a long-thriving football culture that dates back so many decades ago. Thus it comes to no surprise the state boost the largest Argentine following in India. 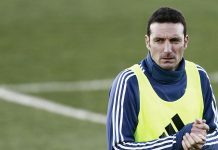 The Argentina Fans Kerala which was launched by July 2012 has amazed with 200,000 followings on his its Facebook page. To celebrate this, several members of this group have decided to make the trip to Dubai for an important mission. 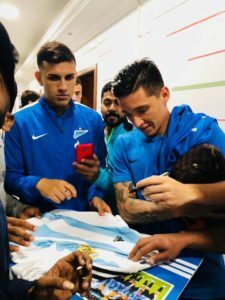 Russian Premier League side, Zenit St. Petersburg were happened to be visiting the Middle East for a friendly and with not but five Argentine players in their squad, the group were presented with a great opportunity to meet their heroes in the flesh. Happiness would become less of a befitting term to describe the emotions of few folks in Kerala(historically referred to as God’s own country) in South India, who are seemingly ‘on cloud nine’ for what was initially thought of as just a distant dream come to reality in Dubai last week. For them, the meetup with few of the best young jewels who have already represented Albiceleste colors in one format or the other could not have come at a better time and place. 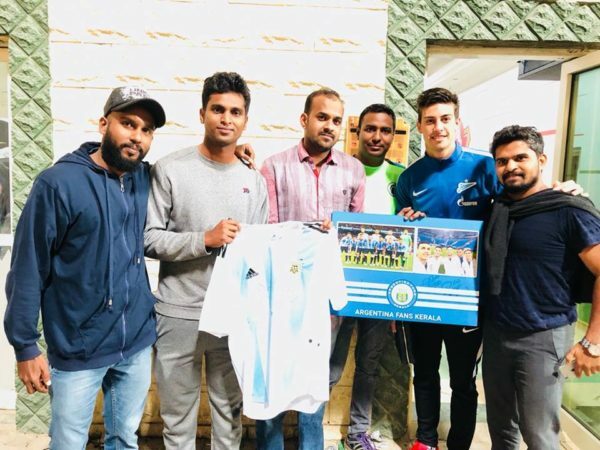 To celebrate the milestone of 200k likes for a Facebook page named ‘Argentina Fans Kerala’ celebrating the achievements of Argentina in the game of soccer covering from historical legacy to day-to-day flashes of brilliance from even the fringe players in the reserves teams of Supeliga, meeting the quintet of Emanuel RIGONI, Matias KRANVITTER, Leandro PAREDES, Sebastian DRIUSSI, Emanuel MAMMANA from the Russian club Zenit St. Petersburg proved nothing short of a magical coincidence. Few of the page admins or community craftsmen rather are from across the Middle East. 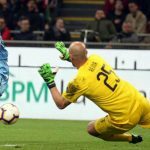 This Facebook virtual community is backed by an intensely active dense pool of fans and well-wishers from across this small state who cheer for not just the wins, but even for any positive development in Argentina in footballing terms. 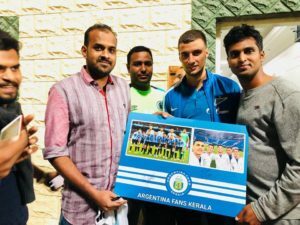 It would never be an overstatement to say that these people in Kerala aren’t any short of passion or spirit compared to the true blue ‘argentinos’. 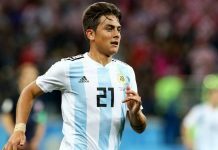 They identify themselves with Argentina and it’s passion for football way easier than any other group of people could with any other nation(love for one’s home nation discarded). 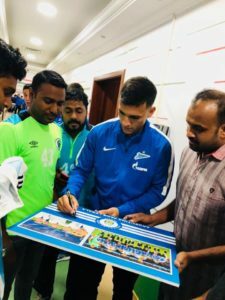 Opportunity came beckoning as Mr. Noushad, staff at Al Shabab football club, based in Riyadh coordinated the whole meet up session after Zenit’s display at the stadium for a friendly match. 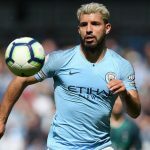 Abdul Khader, chief admin at the FB page couldn’t contain his excitement when asked about his experience talking to PAREDES, MAMMANA and KRANEVITTER who out of the five were found ‘super cool’ knowing there are people of different origin, race, color from a distant part of this world cheering for them as if they were their own cousins. 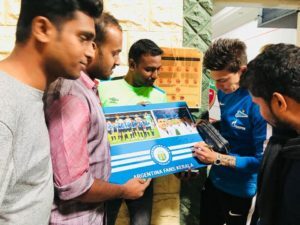 The team from India also gifted the players a memento and in return, they wished all their support for the continued growth and expansion of the page. A big thanks to Shihab Panthavooor and Mohammed Ameen for taking time to share their experience and also these amazing photos for Mundo Albiceleste!